Find all of the PVC Closet Flanges & Parts you need for your residential plumbing system. We offer an array of different sizes and types that will satisfy your every need. The 460-10 from Sioux Chief is a Wedge-It PP Stiff Closet Wedge. The multi-purpose closet wedge is m.. The 410-PB from Sioux Chief is a 1/4” x 2-1/4” Long Solid Brass Closet Bolts Kit. Closet bolts are u.. The 442-2W from Sioux Chief is a SmartCap Universal Closet Cap (pair). It features a taller design, .. The 412-PB from Sioux Chief is a 1/4” x 2-1/4” Log Snap-it Bass Closet Bolts Kit. They are used to s.. The 886-ER from Sioux Chief is a 3/4” Closet Flange Spacer Ring. This 3/4" thick flange extension ri.. The 425-PB from Sioux Chief is a PlumbPerfect Closet Bolts Kit. PlumbPerfect bolts set includes (2) .. The 416-PB from Sioux Chief is a 5/16” x 2-1/4” Long Solid Brass Closet Bolts Kits. Closet bolts are.. The 402-10 from Sioux Chief is a Wax Ring (Gasket) with Poly Flange. Features:Plas.. The 414-PB from Sioux Chief is a 5/16” x 2-1/4” Long Snap-It Solid Brass Closed Bolts Kit. They are .. The 301-065 from Sioux Chief is a Plated Mini-Hacksaw w/ 6” Blade. It's a standard D-shaped miniatur.. This PVC 7/16" thick flange extension ring is used to build up.. The 440-2W from Sioux Chief is a SmartCap Closet Bolt Cover Cap Kit. It comes equipped with two cove.. The 883-PT from Sioux Chief is a 3” Hub x 4” Inside, Total Knockout Closet Flange (TKO), One-piece S.. 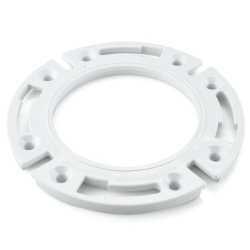 The 886-411 from Sioux Chief is a 7/16” PVC Closet Flange Extension Ring Kit w/ Bolts & Wedges. .. The 886-MR from Sioux Chief is a 7” Ringer Stainless Steel Closet Ring. It fits securely over flange.. The 888-PTM from Sioux Chief is a 3” Inside, Total Knockout Closet Flange (TKO) w/ Swivel Stainless .. The 884-PTM from Sioux Chief is a 3” Hub x 4” Inside, Total Knockout Closet Flange (TKO) w/ Swivel S.. The 886-4PTM from Sioux Chief is a 4” Hub, Total Knockout Closet Flange (TKO) w/ Swivel Stainlees St.. The 886-PTMS from Sioux Chief is a 3” Spigot, Total Knockout Closet Flange (TKO) w/ Swivel Stainless.. The 889-POTM from Sioux Chief is a 3” Hub x 4” Inside, FullFlush Offset Total Knockout Closet Flange.. The 390-50163 from Sioux Chief is a Inside Pipe Cutter for PVC/ABS/Plastic Pipe w/ 1-1/4” Blade. Thi.. The 6010BP from Korky is a WaxFREE Toilet Gasket. Features:A cleaner and more dura.. The 300-12 from Sioux Chief is a 12” SawHorse PVC Pipe Saw. This tool makes clean, precise cuts on P.. The 886-MRM from Sioux Chief is a “Moss Bay” Style Steel Closet Flange Repair Ring Kit w/ Bolts. Thi.. The 6000BP from Korky is a WaxFREE Toilet Gasket w/ Hardware. Features:A cleaner a.. The 490-11322 from Sioux Chief is a Closet Flange Support Kit. It allows to replace rotted-out floor.. The 250-122P from Sioux Chief is a Turbovent Air Admittance Valve. It's designed to control the inpu.. The 887-GPM from Sioux Chief is a 4” Pipe Push-Tite Gasket Closet Flange w/ Steel Swivel Ring. It's .. The 888-GPM from Sioux Chief is a 3” Inside, Push-Tite Gasket Closet Flange, One-Piece, for PVC/Cast.. The 695-Y52 from Sioux Chief is a 2-Branch Trap Distributor Prime Splitter. It's made with brass and.. The 695-D432F from Sioux Chief is a 4-Branch Trap Distributor Primer Splitter. It's made with brass .. The 695-01 from Sioux Chief is a 1/2” Automatic Trap Primer Valve. This is used for water replenishm.. The 886-4PT from Sioux Chief is a 4” Hub, Total Knockout Closet Flange (TKO), One-piece, SCH40 PVC. ..